Greeting From an Old Member! Digital Photography Forums › Digital Photography Forum › Introduce Yourself! So, what's the news about me... I am still taking pictures... and yes, with Mr. Sixty, he is my best friend. Mr. Sixty is a Canon camera, Powershot SX60 HS.... This is my third one... I am very happy with Mr. Sixty, because not heavy and easy than others... I needed this one, because of my hands... and I can carry everywhere with me. How do you post your photographs? Is it need another site (like photobucket) for posting, or can you post an image directly? Have a nice and enjoyable connection for all of us. Hello and welcome back! Nice to have you here with us! To add pictures in a reply, click preview post. Then, you will see more options offered to you. Barbara - Life is what you make of it! (Mar 30, 2019, 08:53)Barbara G. Wrote: Hello and welcome back! Nice to have you here with us! No problem - you are welcome! I use an SX60 when I don't want to lug all my gear, was my wife's Camera and produces some great shots. (Apr 1, 2019, 21:56)EnglishBob Wrote: Welcome back Nia! Hi Nia, I am so happy that you have returned to this fine forum after such a lengthy hiatus, just as I have! I am looking forward to seeing many photos from you, and reading your interesting posts. I hope that I won't bore you too much with my endless Fogo Island landscapes! Nia, I have been using a very nice (and free!) image-hosting site called Imgbb.com to upload my photos to forums, including ShutterTalk. It is very simple to use; you should give it a try when you can find a spare moment. If you have any difficulties I can help to guide you through it. PS: I am attaching a photograph that you may find interesting. This is just one of hundreds of icebergs that we have the pleasure of viewing right from the shoreline in front of our home every summer. That is our daughter Jacqueline who you can see sitting in the foreground. She is a police officer with the RCMP, (Royal Canadian Mounted Police) Canada's world-renown national police force. (very proud Dad here!) These beautiful icebergs are the result of glaciers breaking off of Greenland and eventually floating south to Newfoundland, Canada. This ice is said to be between 10,000 and 15,000 years old, and is believed to contain the purist water on the planet. 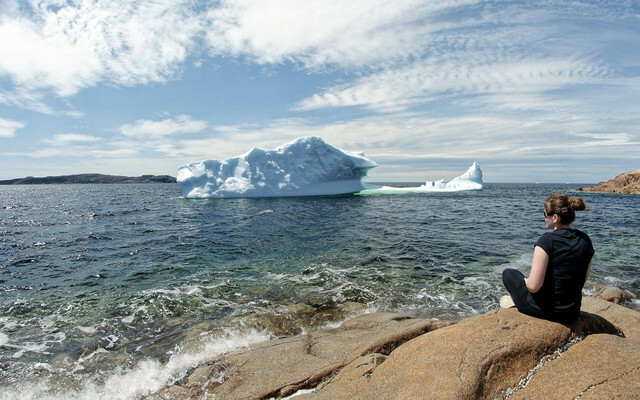 As is common practice with all Newfoundlanders, we often use pieces of ice chipped off from these icebergs to mix our drinks! You see, iceberg ice is much denser/heavily compacted than regular ice, so it will last much longer in a cocktail before it melts.. plus it's interesting, just knowing that the ice in your drink is actually thousands of years old! Current time: Apr 24, 2019, 20:15 Powered By MyBB, © 2002-2019 MyBB Group.